Baselworld 2014: Badollet Stellaire Pièce Exceptionnelle. A Tourbillon with 1,600 Diamonds and a Very Exclusive Presentation Box. Live Pictures and Pricing. You guys know that we are not big on diamonds and we typically stay away from flashy bling watches; however, because Badollet is the name behind this timepiece, we felt it was worth talking about it here. Not only the diamond encrusting work is just out of this world, but the mechanical movement inside this timepiece is a perfect example of 'haute horlogerie'. The new Badollet Stellaire Pièce Exceptionnelle Tourbillon is fitted with a 44 mm 18K white gold palladium coated case encrusted with 1,600 VVS1 diamonds, weighing close to 13 carats, blued hands and a very elegant black alligator strap with deployant buckle. As you will be able to see in these pictures, the diamond setting on the case, dial, case lugs, crown and even on the tourbillon itself, is literally pure perfection. The beating heart inside this timepiece is the Badollet manual-wound calibre BAD1630 with tourbillon, baseplate out of meteorite and aluminum and lithium bridges representing galactic circles. The movement includes 27 jewels, a power reserve indicator visible only on the back and the tourbillon visible on the dial side at 6 o'clock. The movement —fully visible via the display case back— is entirely hand-engraved and it provides a power-reserve of five days when fully wound. While we typically won't feature the presentation boxes of the watches, unless we are doing a feature all the way from the unboxing, the presentation box accompanying this watch is definitely worth talking. When you pay close to half a million dollars for a timepiece, you want to make sure that the box is up to par with the timepiece. In this case, we can attest that it is. The watch is presented in a wooden and glass exhibition display box fitted with a natural grain leather cover —by the way, very Hermès looking. The wooden and glass display is approximately 25 inches tall and is fitted with three drawers. Two drawers that serve as valets for cufflinks, rings, money clips, or extra straps and the third one to hold the elegant leather travel case that comes with it. 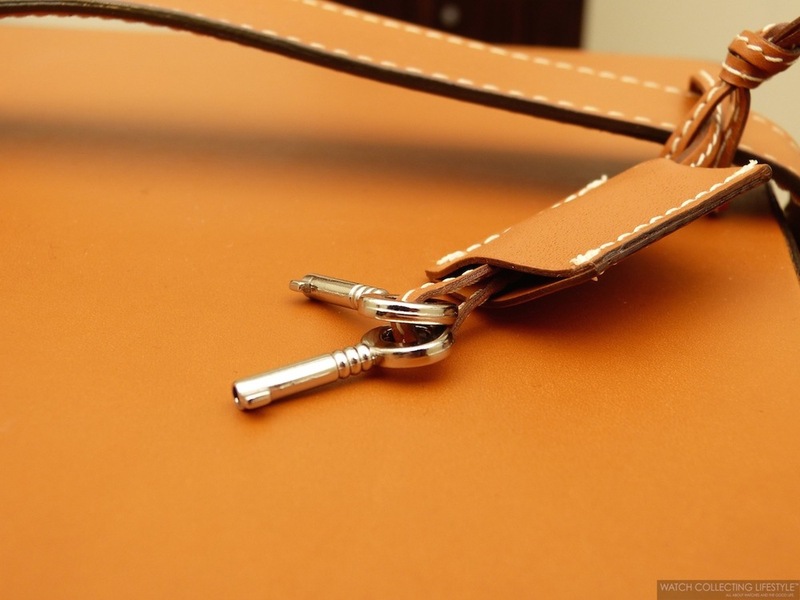 A set of keys is also provided to keep the timepiece safe while left unattended. Frankly, we have never seen any other presentation case like this before. If you like bling watches a.k.a iced out timepieces, this is the way to go. While we are not into iced out watches ourselves, we can appreciate the work and passion behind creating a timepiece like this. Now remember, this is not your average run-of-the-mill diamond encrusted watch that recording artists are wearing left and right. 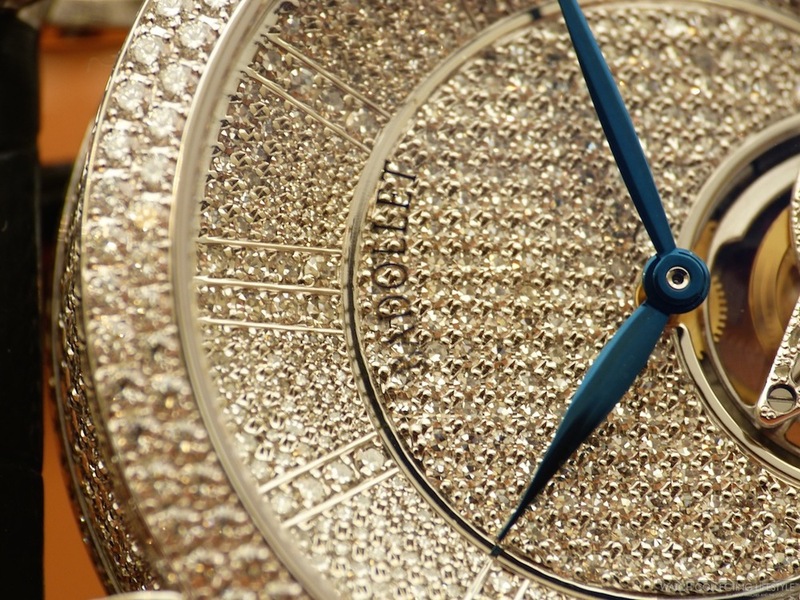 If you want diamonds and can afford a tourbillon with 1,600 of them, then this timepiece is made just for you. Sticker Price 420,000 CHF ex VAT —approximately $462,000 USD. 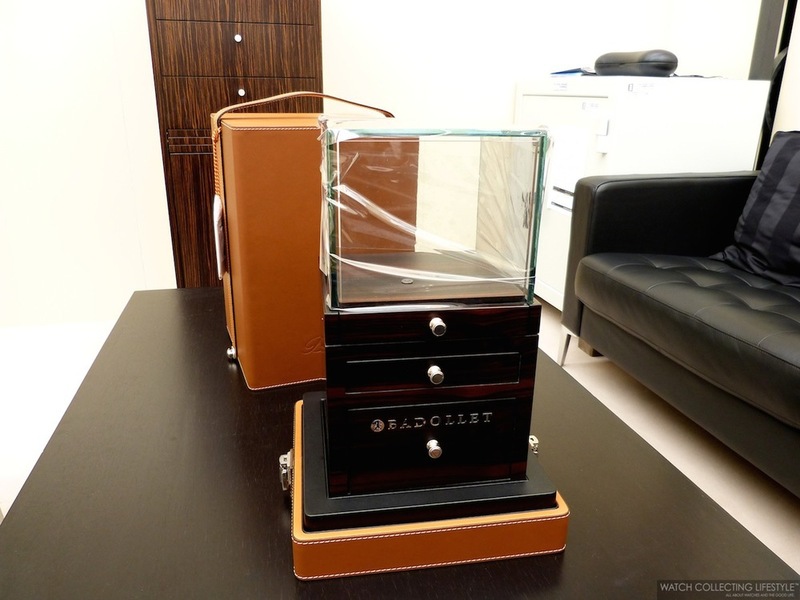 For more info on Badollet click here. Posted on April 10, 2014 by Editor & Publisher and filed under Baselworld, Badollet and tagged Badollet Stellaire Piece Exceptionnelle.